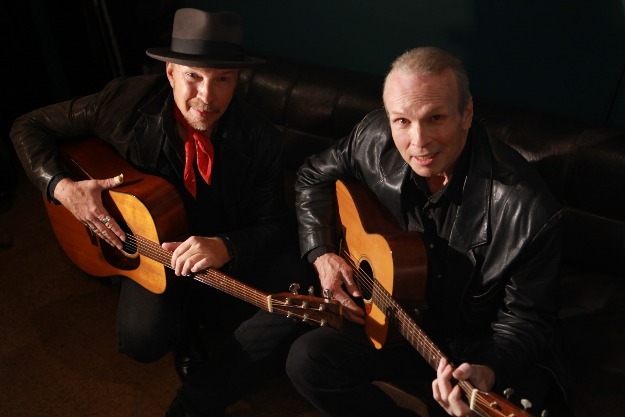 Brothers Dave and Phil Alvin are back at it again, having just released "Lost Time", their second album together in the last two years. The brothers appear Thursday, Sept. 24 at the Aladdin Theater. Their 2014 release "Common Ground" paid homage to Big Bill Broonzy and "Lost Time" finds the pair returning to early blues music, but with a wider variety of artists to draw from, particularly Big Joe Turner. The album was released last week on Yep Roc Records. In contrast to the acoustic arrangements found on "Common Ground", "Lost Time" is largely upbeat, driving, and electric. Dave's strat sizzles (I'd recognize the sound of his amp anywhere) and Phil's tenor vocals are as sharp as ever, easily spanning the distance in time between when these songs were written and now. "You go down and see the banker / And you ask him for a small loan / You can bet your last good dollar / That the banker's gonna get your home." "Lost Time" also includes In New Orleans (Rising Sun Blues). Most people are familiar with the 1964 version recorded by The Animals as House of the Rising Sun, with its classic arpeggios and recorded in A-minor. Most music historians agree that the song likely originated originated in Appalachia sometime prior to the 1930's. Clarence Ashley made one of the earliest recordings of the song in 1933. Ashley's version was recorded in bluegrass style and the Alvin's version conjures up a similar feel with a finger-picked acoustic guitar, driving drums, and harmonized vocals, with Dave carrying the lead. 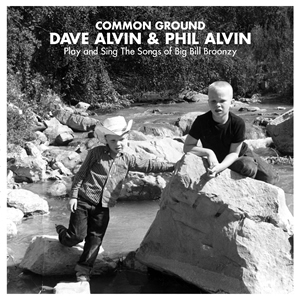 "Common Ground" showed that Dave and Phil have a tremendous grasp of blues history as they paid homage to Broonzy. In "Lost Time" they shine the most when returning to these same roots on three Turner songs, Cherry Red Blues, Wee Baby Blues, and Feeling Happy. Cherry Red Blues will have you foot tapping from the first measure with its old-time blues arrangement with upright bass, subtle piano licks, and triplets. In listening to the song, I can close my eyes and see Phil in a smoky blues joint under a spotlight joined by a three-piece band. In black and white, of course. Turner's Wee Baby Blues is a straight-up twelve bar blues number with a fat electric guitar and a huge electric bass line. Ample reverb on the guitar and Phil's vocals give the song lots of roominess, making it a big and bold tribute to Turner. Feeling Happy is everything the title connotes: energetic, engaging, and propelling. Like the other two Turner cuts on the album, Phil's vocals harken back to a time lost long ago. It would be tempting to think the album title refers solely to the time lost between the brothers during their long estrangement. To do so, however, would ignore the deeper, more powerful meaning of this album. We all suffer from lost time and are products of the passage of time before us. And, every so often, someone like Dave and Phil cares enough to remind of us of our shared heritage. "Lost Time" is a tremendous album, deserving multiple listens as you search through the history of each cut. The material is a perfect project for the brothers, fitting of their individual styles and strengths. If there was a Grammy for Keeper of the Blues, Dave and Phil Alvin would be hands down favorites. As they have for the past few years, The Guilty Ones will be joining the Alvins: Lisa Pankratz on drums, Brad Fordham on bass, and Portland's Chris Miller on guitar. Doors are at 7:00pm and as of this writing, tickets are still available. Don't wait, though, as their last appearance at the Aladdin sold out.